Making Pottery in Chilliwack, B.C. Living in our wonderful new studio space, overlooking the Chilliwack River, I am so fortunate to be able to work in a studio surrounded by inspiring mountain views and gardens, hawks, eagles and herons. With the noise of the river flowing through the studio, and family always close by, this time spent with clay brings great joy and fills my heart. 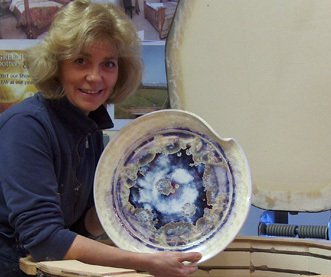 If you enjoy radio podcasts, this link will take you to an insightful and interesting interview of Holly McKeen, by Paul Blais on "The Potter's Cast" at thepotterscast.com There are also podcast notes and photos with this link that tell more about the life and career of this Studio Potter. 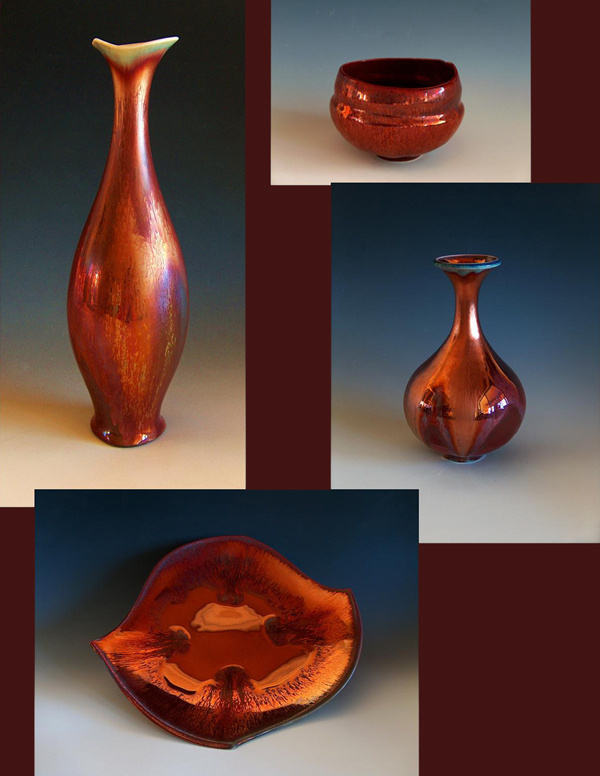 I discovered crystalline glazes several years ago and have grown entranced with pushing the limits to create these extraordinary glazes while also focusing on the importance of simplicity in the forms as a palette. I enjoy creating classic yet simple forms with sensuous curves and flowing lines, which compliment the elegance of the crystals. Crystalline glazing demands a technical mindset, and an interest in the chemistry, complexity and precision of glazing, requirements that suit my personal style. These brilliant ruby red pots are made with a combination of crystalline and copper red glazes, and undergo a third firing in a small gas kiln to achieve a "post fire reduction" effect. Again, a very tricky process to have the glazes, application and firings come together to produce these stunning red results! I also love making functional pots for everyday use, incorporating contemporary styling, curves and bright modern colors. I like that I can spend time on each new design, reflecting on how the piece will work, how it feels to touch and to hold. Having my Pottery clients and friends visit my studio allows me to share my excitement at the wonder of working with clay with visitors and develop relationships with the new owners of my pottery. This interaction is important to me. The continuing study of form and glaze provides a balance that mirrors my desire for beauty, sincerity and grace in my own life. I want my pots to have a quiet presence and simplicity, and I have a lifetime ahead to pursue this quest. Various workshops 1970-90 in Painting, Graphic Arts and Cartooning. Studied with Porcelain Masters Tom Turner, N. Carolina, 2010 & Marsha Silverman, Miami, 2011.